1. Made from high quality CNC aircraft grade aluminum material . 2. Stable shooting device which is customized for smart phone . 3. Built-in high precision gyroscope, sensor and brushless motors enable you to get more stable footage fast . 4. Can be connected to the phone via Bluetooth to realize the shutter release, face followed, automatic panorama function . FUNSNAP Capture Three-axis Handheld Gimbal is a cost-effective choice for those who enjoy taking videos with their smartphone. 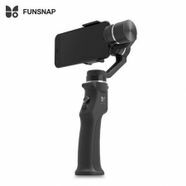 Ultra-light, agile, and powerful, the FUNSNAP Capture Three-axis Handheld Gimbal, makes every frame you capture smooth and steady while eliminating all shake in the shooting. Leave behind your photography bag with all the heavy gears, now you can travel lightly and still keep those precious memories with perfect details. 5. Accurate face recognition and nice follow speed . 6. Applicable operation system: for Android 4.0 and above, for iOS 8.0 and above .